Steve Carell and Timothee Chalamet are already gaining awards buzz following the first trailer for Beautiful Boy. Chalamet previously starred in Call Me by Your Name, which gained him numerous award nominations, including an Academy Award nod for Best Actor. At 21-years old, he was the third youngest actor to receive a nomination in the category since 1939. 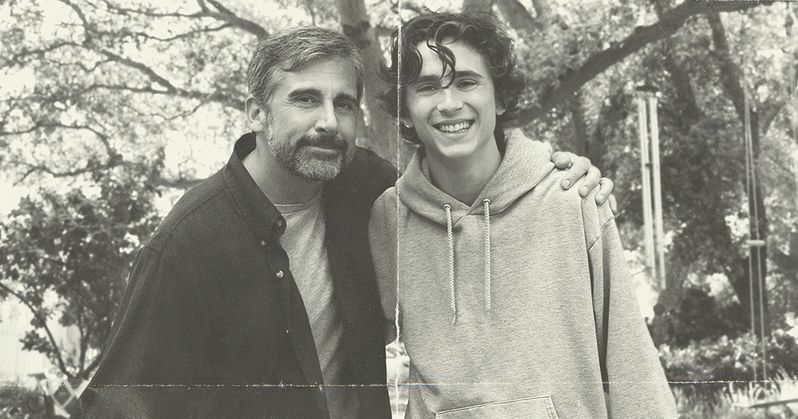 Beautiful Boy pits Chalamet's Nic Sheff up against drug addiction while his father, David Sheff (played by Carell), helplessly watches his son struggle while a family dissolves. The awards buzz seems obvious after watching the trailer for Beautiful Boy just one time. Both Steve Carell and Timothée Chalamet bring powerful performances as a family is torn apart by drug addiction. The movie is directed by Felix Van Groeningen (The Broken Circle Breakdown), and also stars Maura Tierney, Amy Ryan, Jack Dylan Grazer (as young Nic Sheff), Kaitlyn Dever, and Timothy Hutton. While the trailer puts the focus on Carell and Chalamet, there's still a lot more story to be told through the point of view of the various family members. Beautiful Boy is based off of the memoirs by David Sheff and Nic Sheff, recounting Nic's battle with addiction that tore through his family. Beautiful Boy: A Father's Journey Through His Son's Addiction is David's best-selling book that told the story of Nic's addiction through the eyes of the family. The idea originally sprouted from an article that David had written for the New York Times entitled, My Addicted Son. Nic also wrote a book about his addiction through his eyes, which was called Tweak. Both books were released at the same time. Beautiful Boy started back in 2008, when it was announced that Paramount Pictures and Plan B Entertainment had acquired the film rights to both of the Sheff memoirs. The studio wanted to be able to craft a movie that told the story of drug addiction through the eyes of the person suffering as well as the family perspective. Cameron Crowe was first attached to write the screenplay and direct the film, but he was later replaced by Belgian director or Felix Van Groeningen in 2015. Steve Carell was cast in January of 2017 with the announcement of Timothee Chalamet signing on arriving the following month. Production for Beautiful Boy started in March of 2017 and shot through May of 2017 around the Los Angeles and San Francisco areas. Director Felix Van Groeningen has said that the hardest scenes to shoot were the ones where Nic Sheff had been hospitalized for an overdose. Timothee Chalamet was instructed to lose weight and lost 20 pounds for the scenes. However, the actor lost too much weight and had to recover for weeks after the scenes as instructed by doctors. Beautiful Boy will hit theaters on October 12th, 2018 and you can watch the trailer below, provided by the Amazon Studios YouTube channel.